Stress is a part of everyday life. Rather than avoiding stress it is much more effective to learn how to manage stress. 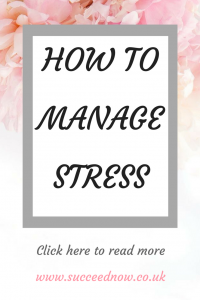 There are a few tools that I use daily to manage stress and I have found really useful. When I have a lot on my mind I take some time to write down everything on my mind (also known as a brain-dump) this allows me to clear my mind and helps to manage stress levels if there is something I’m particularly worried about. I journal as part of my morning routine so have time in the morning to write down my thoughts. I also take the time throughout the day if I need to get something off my mind. Even simple things like writing a to-do list or any ideas that you have to get them off your mind and onto paper. I make self-care a part of my daily routine, it’s so important to make the time to put yourself first especially in your busiest times. This is when you need it most and it can really benefit you to schedule time for self-care. This can be as simple as having a break to go for a walk, listen to a podcast or read for a while to get away from being busy, daily tasks or chores for a while. I also like to take a while evening off at least once a week where I do a few activities that I enjoy and take some time for myself without any distractions. Mindfulness practices can be done daily with little effort and time. You can choose every day routines and add mindfulness to them. For example walking, eating or brushing teeth. You can use this time to be in the present moment by focusing on the task you are doing and how it makes you feel. It is important to practice mindfulness regularly as a habit rather than just in times of high stress. You will find that your stress will be reduced by practicing mindfulness regularly and it will be a perfected habit when you do need it most in times of stress. Let me know how you find this helps you and managing your stress levels. I would love to hear any other techniques you’ve found useful. These are such great tips. A good self care routine is so important for stress management. Great ideas! Brain-dumping really helps me organize my thoughts. I love writing things down. I’ve recently started listening to podcasts in the morning while I get ready to start me on a good note! I will definitely have to practice being more mindful. Although I try practicing mindfulness, stress is something I really struggle with. I like your idea of brain dumping – I’ll give it a shot and let you know how it goes! Self care , journaling, and exercising are my top three ways to relieve and manage stress. Especially now, while studying for an important exam . It is imperative that I manage stress levels to remain sane! These are great tips, I’m definitely going to try some of them, especially the writing part. Thanks so much for this tips! A great reminder for me especially the self care tip. I definitely need to do this more often. Lovely post, enjoyed reading it! Writing is an excellent coping mechanism for me. I find that when I write stuff out it often feels less overwhelming and easier to tackle. I agree with having a slid self-care routine; that is the ultimate foundation for remaining grounded in stressful situations.